The Blackfoot Nation is made up of four tribes including three First Nation tribes in Canada and one Native American tribe in Montana. These tribes once lived throughout the northern Great Plains hunting bison herds. 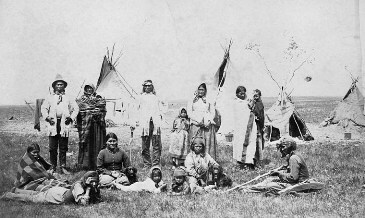 The Blackfoot people lived in small bands throughout the northern Great Plains. They moved from place to place following the large bison herds. In the early 1800s, the Blackfoot were introduced to horses. Horses allowed them to cover a larger hunting ground and made it easier to hunt bison. The Blackfoot soon became the dominant people in the northwestern Great Plains. They were fierce warriors and protected their territory from other tribes such as the Lakota Sioux and the Shoshone. In the mid-1800s, the Blackfoot began to struggle due to the encroachment of white settlers. Overhunting caused the bison herds to dwindle and food became scarce. The Blackfoot signed treaties with the U.S. government that were later broken. They were forced to move to reservations in Montana and Canada and take up farming to survive. What kind of homes did the Blackfoot people live in? The Blackfoot lived in teepees made from bison hides and wooden poles. Teepees were easy to break down and set back up. This made them perfect for the nomadic lifestyle of the Blackfoot. The Blackfoot have their own Blackfoot language. It is an Algonquian language, so they could communicate with other tribes who spoke similar languages. Some examples of Blackfoot words include "natosi" for "sun", "oki" for "hello", and "imitaa" for "dog." The Blackfoot wore clothing made from deerskin. Men wore breechcloths, leggings, and shirts. Women wore long dresses. In the winter, they kept warm with thick robes made from bison hides. The main food for the Blackfoot came from the bison. They hunted other animals when necessary such as deer, elk, and rabbits. The women gathered berries when they could. For the winter, they made a mixture called pemmican from dried bison meat, berries, and fat. How did they get the name Blackfoot? The origin of the name Blackfoot is a mystery. Some people say they got the name because they dyed their moccasins black. Other people think that soot from prairie fires turned their moccasins black earning them the name Blackfoot. Sometimes they are also referred to as the Blackfeet people. The early Blackfoot people had little in the way of government. They lived in small bands and each band had a chief. They sometimes had a separate war chief and civil chief. 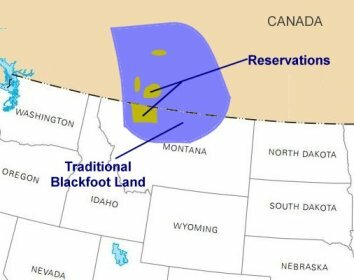 Today, the Blackfoot reservations are governed by a tribal council. When pitching a new camp, the Blackfoot always built their teepees with the entrance facing east. The four tribes making up the Blackfoot nation are the Southern Piegan, Kainai, Siksika, and Northern Piegan. The Blackfoot enjoyed decorating their clothing and their teepees. They often painted designs on their teepees. There are around 32,000 Blackfoot people in Canada and the United States today. Around 7,000 live on the reservation in Montana.